A friend of mine lately tinkered a bit with his training and used HLM as a guidance. However, it somehow looked and felt more like a Texas Method. He shifted the days a bit because of his schedule and wondered, whether the difference between the two is just the order of the days. Curious. I told him that the difference is in the paradigm. When asked for a good source  on this I could not help and so I decided to rectify this nuisance. Let me first quickly introduce both training programs, for those who are not familiar with one or the other. Both are interemediate programs and allow, at least in the beginning, for a linear progression on a weekly basis. The equal sign(=) denotes sets across, i.e. using the same weight for all sets. In the lingo of Rippetoe fanboys, Monday would be aptly named Volume day, Wednesday would be the Light day and Friday is called Intensity day. Often you would alternate each week between press and bench, using slightly lower weights on Wednesday than the week before on monday. The upwards pointing arrow(↑) denotes sets with ascending weight, i.e. increasing the weight to one top set. Here one would use simply name the days heavy day, light day or medium day depending on the relative intensity. Basis of any training program is the principle of supercompensation: You apply a training stress large enough to break homeostasis, but not so large as to destroy your capability to recover. Your subsequents performance drops as you need to recover, but after recovery, your performance should be a little bit higher than before applying the training stress. At least that is what most theories boil down to. Of course you can make this arbitrarily complex and you have to account for structural damages to sinews and bands, of which you can accumulate quite a bit, before a drop in performance becomes noticeable. In most of the theories there is a superposition of stress-recovery adaption cycles working on different time frames, accounting for the different components involved in strength training (i.e. passive and active structures, neuronal, hormonal and metabolic factors). Both HLM and Texas Method operate on a weekly time frame: A full stress-recovery cycle is completed over the course of one training week, enabling one to use more weight each week. So if you want to run them as a cookie cutter program, you have to be an early stage intermediate using weights which can be realistically increased every week, but not every day. This also implies that the damage to passive structures and the stress to your nervous system is still controlled in the sense that it does not limit your weekly progress. At least for the first six to twenty weeks. In particular this justifies to only concentrate on the stress-recovery-cycle of the musculature, ignoring other factors, when considering these training programs. So how do the programs employ this and where is the difference? The Texas Method is simple: Apply the training stress on Monday via the grueling (at least for males) volume day and immediately start recovering, i.e. sleeping and eating, in order to harness the supercompensation on Friday and setting a new PR. Wednesday is just for recovery purposes and should alleviate the soreness from Monday. On the left you can see what a typical training week would look and feel like on the Texas Method. This is just a qualitative description based on experience, no meaningful data was used. However one sees that the volume day is really the heaviest and hardest day in the week, at least if you are an adult human male. When running a Heavy-Light-Medium template, the nomenclature would lead one to the believe that it is just a Texas Method with the days switched around and named differently. Much of this is owed to the fact that both programs are commonly labeled as "5×5", but actually one uses sets across, the other one uses ascending sets of five. And here is actually a big difference, if not the difference. The heavy day of HLM is more of an interpolation between intensity day and volume day in the Texas Method, as one accumulates quite a bit of volume on the way to the top set, which is consequently not as heavy as the top set in the Texas Method (although it still should be a new 5RM). On the other days you reduce the overall intensity and consequently the volume. Again you see what a typical training week would look and feel like, again based on personal experience. The highs are lower and the lows are higher than in the Texas Method and you do not really see the supercompensation take effect. 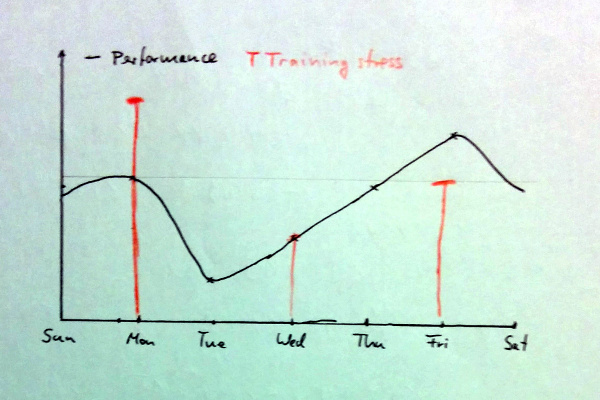 However you can see that at the end of the training week your performance approaches the peak before Monday. At the end of the week there is quite a bit of variance. It is not as clear cut as the Texas Method, as the training stress is not so pronounced. Instead, we have more training stresses, but each one is able to produce a break in homeostasis. Indeed, on HLM you trade one big training stress against many smaller ones, as not to risk diminishing your recovering ability. This is a huge plus for people with limited recovery, including older trainees, people with sleep issues and anorexics, where in the context of Texas Method, anorexia is defined as eating less than three grams of protein and 50kcal per kg bodyweight. On the other hand, Texas Method works incredibly well if you are young, male, in a caloric surplus and sleep sufficiently. It is fascinating to really see how the Monday drives the Friday, making one believe that this is the right way to do programming. However, on HLM, you simply accumulate stress over the course of a week in a way that you recover from it. The variation in intensity is owed to the advancement of the trainee, as he could not sustain the intensity required to break homeostasis for a whole week, but indeed he applies multiple smaller stresses, each able to break homeostasis. This seems to be a much more sensible approach. Well, one of the main problems with these theories is that they were developed ex post: Both Texas Method and Heavy-Light-Medium grew in the weight training rooms of American football teams. Both required not much of equipment and especially HLM was easy to implement on large groups of athletes, as everyone could just take turns with the same weight. This has always be taken in consideration when looking at cookie cutter programs: They are proven to work, but only if you are close to a college football player. 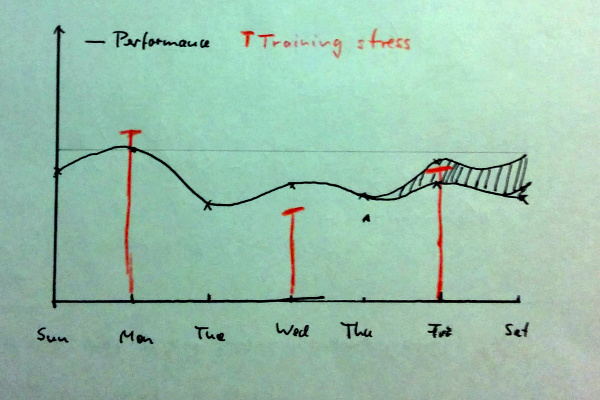 Again, the basis of all training programs is the stress-recovery-cycle. You always have to break homeostasis in order to provoke an adaption. Then you have to give the body time and resources to actually adapt. Since both training programs work on a suitable and comparable population, they solve this problem. In particular both approaches work and it does not really matter, how we accomplish the break in homeostasis and subsequent recovery. This can also be seen when comparing how top powerlifters train. Some use absurd, almost bodybuilder like volumes, others train each lift on it's own day and some train daily with lower repetitions. As everything works, the question is not, what is best, but what works best for me? If you are constantly undereating and undersleeping, Texas Method might teach you how to stop doing that. Or it might just run you into the ground faster than you can say GOMAD. Indeed, if you are already a intermediate trainee in a later stage, you probably won't be able to run one of these programs out of the box. If you already did some volume heavy programs, the volume day on the Texas method won't impress you. Or if you already quite strong, the damage to passive structures of the volume or even intensity day would be too high to recover from sufficiently. On the other hand, if your 5RM is very far from your 1RM, it is improbable that you can move a weight for five reps, which is heavy enough to drive adaption in only one top set. Here TM might just do the trick, or you have to do some of the sets in HLM as sets across, as to reap more volume with higher percentages. Indeed, most more advanced templates of HLM or TM just do this: They incorporate more and more features from the other one, and also some sort of periodization. But when it comes to this, you should try do develop a feeling for what works for you, instead of just copying down training programs. While both are featured in Practical Programming for Strength Training (English Edition) and Rippetoe describes how in Texas Method the Volume day "drives" the Intensity day, it was not very explicit on HLM.